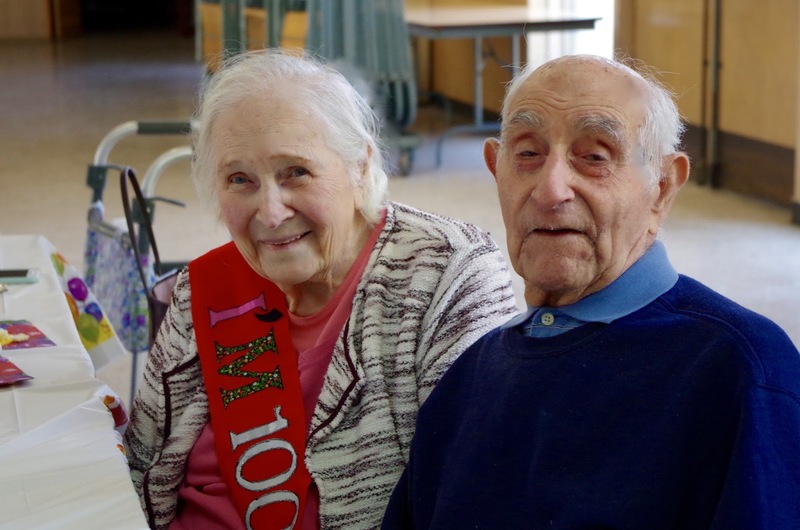 May 24 was the 100th birthday of my precious grandma Jody! After a week of celebrating with family and friends, she’s about over it, but I am still thrilled that she made it to this milestone. Everyone always asks about her, so I thought I’d share some pictures here and also a little bit about her long life. It still amazes me that she was born when most people still used horse and buggy. She has seen so much- the beginning all modern innovations happened during her lifetime- the car, the phone, television, radio, refrigeration, the computer and much more. She remembers them all. She even has recollections of sitting on her front porch when they heard Lindbergh crossed the Atlantic from New York to Paris in 1927! Josephine Mary Eaton Fleming was born in Walla Walla, Washington in 1917. 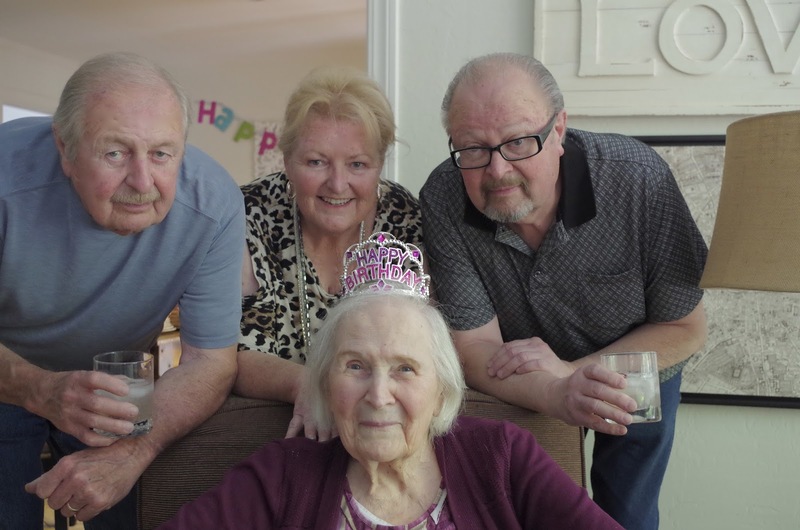 Her childhood was spent in Milton-Freewater, Oregon, where her father was a cement contractor and built the town pool, where she learned her love of swimming. Sadly, the depression hit and the cement jobs went away. To make ends meet, her father Cody and mother Edith joined other family members as migrant fruit packers all up and down the West Coast. They would travel from Washington where they’d pack apples and pears, to the Bay Area with it’s abundant apricots, down to the Inland Empire, where they’d pack iceberg lettuce. Grandmother went to high schools in Oregon, San Jose and El Centro, California. It was a hard life, though quite lucrative for the depression. They only owned what could fit in a car and rented the same homes each year as they traveled the fruit circuit. Grandma’s yearbook. She’s the middle left and in the group photo, third row down, second from right. One stabilizing factor and bright light in her life was her own grandmother, Mary Eaton, her father’s mother. She lived on Lake Chelan, Washington and doted on Josie, as she like to call her. She attended some high school in Lake Chelan and spent many hours swimming on the lake, sneaking into boat houses, and learning to sew from her grandmother. 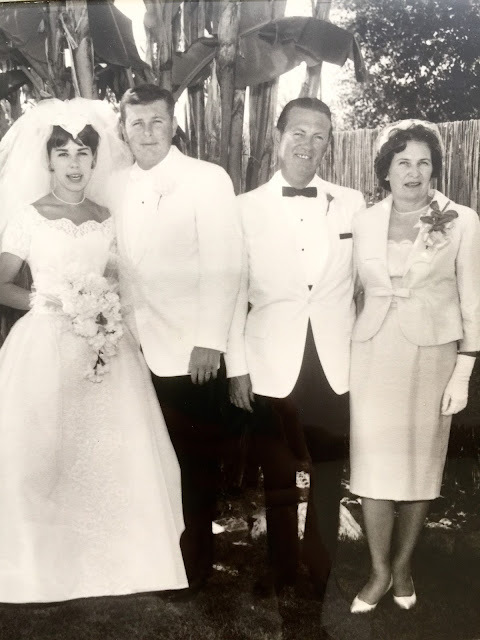 She also learned a lifetime of good eating habits from her grandmother as her grandfather was a diabetic who was diagnosed before insulin was invented. Healthy foods and grains were something she used even back then to keep her husband healthy. They grew their own vegetables, canned and ate from the giant sauerkraut barrel that was in the yard. Her grandma would put a hot water bottle in her bed on nights when it was cold, and she treated her to little things like her favorite jars of Pimento Cheese spread, when no money was to be had for extras like that. Grandma right with her mother Edith and my dad, Ray. Isn’t this coat chic? One of my favorite photos of my grandparents on a swing in the 1940s. Grandma married my grandfather Ray in 1937, when she was 20, the same year the Golden Gate Bridge opened. He like so many in this area, was in the fruit business, having his own market stand and was later in sales in the orange juice industry which brought them to Fullerton in Southern California. They lived for a time in a cute Spanish Mediterranean home where my dad, Ray Jr, remembers going to school barefoot on warm days (no one made sandals for children in the early 1940s), and watching Disneyland get built in nearby Anaheim. They moved back to San Jose just before it opened and he never got to go. I love my Grandma and Aunt Wendy’s Easter bonnets here around 1950. A family road trip to Yellowstone around 1955-56. Grandmother always wore dresses and never wore pants until the mid 1970s. I remember the exact day she came over in a pantsuit. It was a big deal! During those kid years my grandmother was a Boy Scout leader, or den mother and later a Girl Scout leader for many years. She also was a very involved mother and sympathetic to multitudes of hamsters, cats and tropical fish, among all the other parenting things. She has many funny stories of raising her kids, but always ran a tight ship as my grandfather liked a tidy home. My grandparents lived in San Jose after that and my grandfather got into real estate and developed the Wilcox Park track in Willow Glen. I always thought my grandmother’s 1960 home was super cool with it’s sunken tubs, beaded curtain door to the bath, central atrium, and fossilized stone walls. I loved her panoramic master closet with plexiglass boxes of shoes organized by color, and her lipstick drawer with color-coded lipsticks as well. She was always a super organizer, but that home was not in my grandmother’s taste. She was forced to move into it, one of my grandfather’s model homes, decorated by Brueners, when it languished on the market. Her own home, which she had in a colonial style, in her favorite turquoise tones, had to be sold. She missed the home and the beautiful yard with it’s pool she swam in and it’s big banana trees she planted. My parents, Sue and Ray had their 1964 wedding reception in that lovely backyard with it’s tropical vibe. You can see the fence and banana trees in the background. My grandmother helped plan all the details. Grandma was devoted to my grandfather though and did whatever he wanted. Grandfather who was always sharp dressed as well, was a lifelong golfer and unfortunately died in his seventies of a heart attack on the golf course. Jody eventually moved into a condo and spent the next 30 years busy with her church activities and sewing and other hobbies. She has been a member of her Calvary United Methodist Church in the Rose Garden area of Willow Glen since 1940. As far as I know, she is the longest member, and still goes when she can. I always take her to the Lunch Bunch group monthly and they had a little birthday celebration for her this year. Grandma totally lived unassisted until two years ago when she had a fall and needed a plate put in her upper leg. She now is in assisted living and uses a walker, but is trying to stop using it!! She drove until age 95. I took her for her license renewal at age 92 and they gave her a five year extension! She vowed to stop driving for her safety at 95, but it did set her back a bit as she didn’t get around as much as she liked. She has always been a great walker all her life and did a lot of walkathons as long as she could. I’ve been really lucky had a close relationship with grandma and spent a lot of my childhood at her home. She was always one of those people who was born to be a grandmother. I loved her house as she had seven cats, a toy cabinet, a button box full of vintage buttons and two candy dishes! Scattered about her home were little chairs and stools for my brother Peter and I so we could help out with things, like washing dishes or making a chef’s salad, which I learned at an early age from her. I now am the keeper of the button box. 🙂 I also have a trove of beautiful vintage gloves and heaps of hand-embroidered hankies which were hers. She let us do things our mom had no patience for like playing in the mud and making mud pies, trying out the taste of dry cat food, (really! ), making home-made bubbles and sugar cookies in our hand shapes. I loved those cookies especially and always gave my hands long red nails and big rings, naturally! My family in front of my grandparent’s modern home on my first communion 1972. People also always ask her secret to her beautiful skin and she says it’s scruffing or exfoliation and no soap ever. She’s been using cold cream, and Merle Norman products since she was pregnant with my dad in 1939! She slathers on cold cream nightly and removes it with a rough paper towel in a scrubbing motion. I guess this is a pre-runner to exfoliating scrubs. She never sunned and never smoked and never really could drink very much, also contributing to her pretty skin I’m sure. A steady diet of veggies which she always grew, might also be a part. One thing about grandma is no matter what she has encountered, her attitude has always been positive. That alone may be the key to her longevity. She always sees the glass half full. She loves people and being social and she always has been busy with projects whether they be sewing, canning, baking, crafts or gardening. As long as I can remember she had some little activity going on. And she like to giggle. I’m so grateful I’ve had her so long and still have her. I think it’s funny now I am older than she was when I was born, which was 48! Each Thursday we get together. I always look forward to our chats and I do her nails. 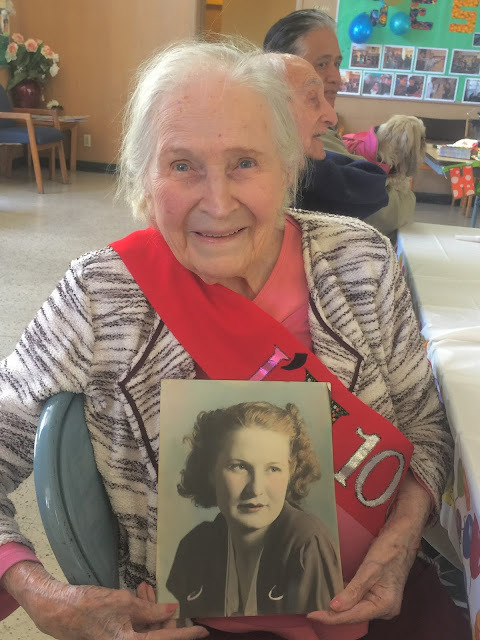 She still loves clothes and looking pretty, even at 100. Here’s a few more of my favorite photos from her long life! 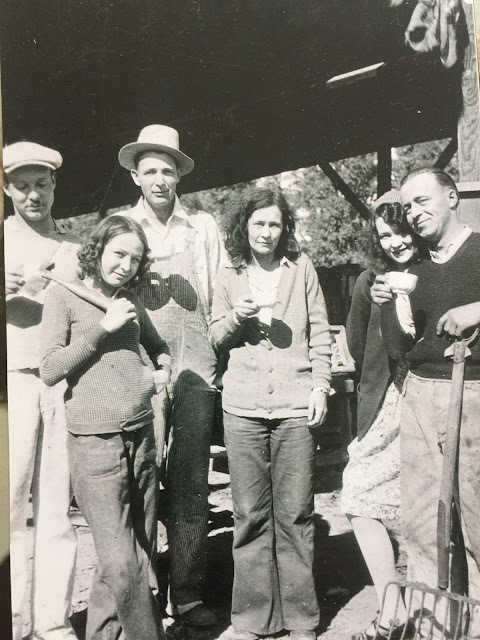 A great photo of the fruit packers or fruit tramps as they were called, taking a break for tea or coffee. Grandma is the young one in front of her tall father Cody and mother Edith ,who reminds me so much of her sister Nora in later years, here on the right. 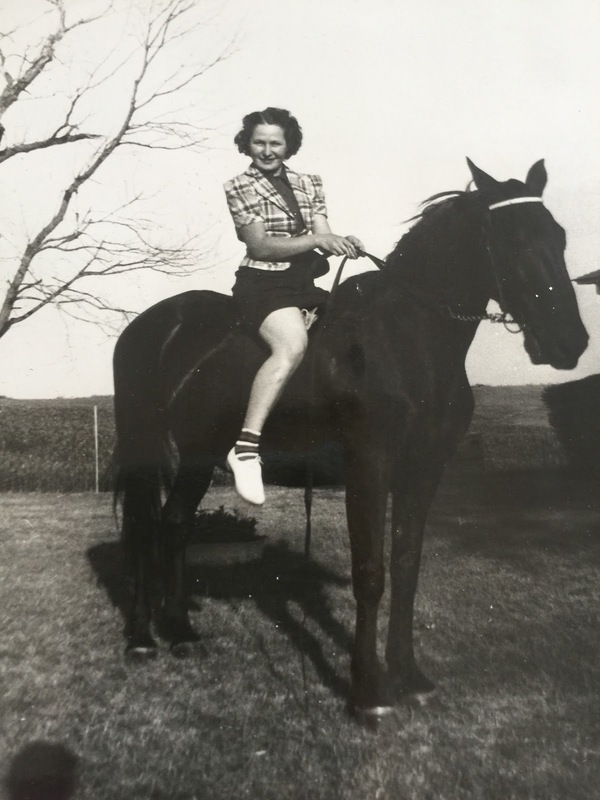 No idea where this was taken, but it may have been in Mount Ayr, Iowa where my grandfather grew up on a farm that my great-grandparents still lived on until the 1970s. On a cool car on a road trip. Looks like a roadside picnic with a sandwich in her hand. This was taken around age 17. At that age she saved and bought herself a big rectangular black onyx ring with a diamond in it. They were all the rage and she gave it to me when I turned 17! 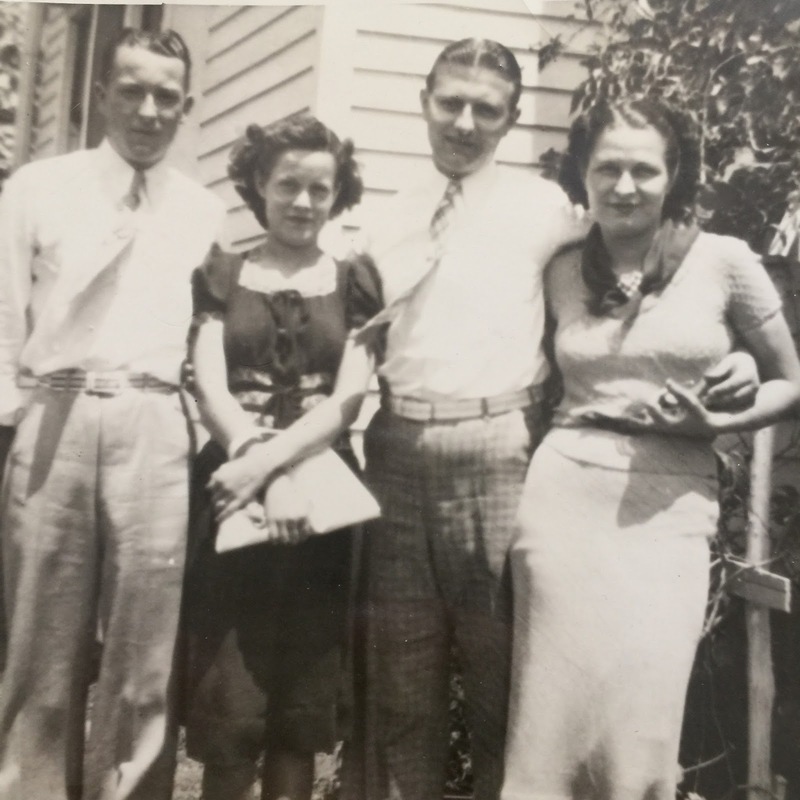 This is grandma and husband Ray right, with his brother Rex and his wife. With her mother. Love this one. Her mom was quite stylish too. Love her black gloves, sash and pin. Sunbathing with my dad and grandfather. This vintage 1940s (?) bathing suit was one of my grandmothers we found when helping her transition to assisted care.. I love that she still loved turquoise colors back then. She also had a collection of Esther Williams style flowered swim caps which I adored as a kid. I wish those were still around. I also found this Dynasty pattern outfit from the 80s she was making for herself.. More of that blue. I don’t think this ever got finished, but she was an amazing seamstress and could even make suits and coats! She made so many of my dresses and clothes as a child and my mother and I had many matching dresses in the 1970s. She has tried to teach me to sew, but I am hopeless. With my boys when she was still cooking. This is her famous bunny cake I grew up with each Easter. She still made it for all the grandkids as long as she could. 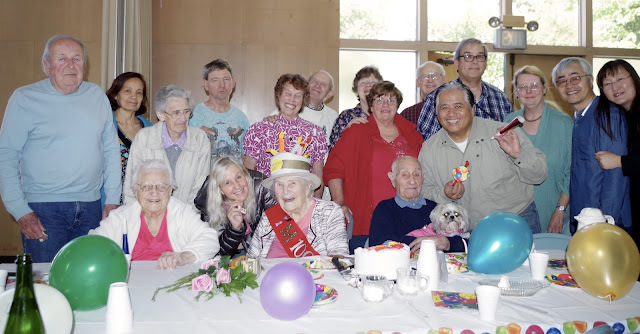 Her church had a celebration for her this week at it’s monthly Lunch Bunch. With friend and younger man (92), Sal. He’s a sweetheart. I like to tease her and say he’s her boyfriend! With her friend Fern and below some of her church group. The pastor’s wife Maria handmade the pretty sash for her that read ‘I’m 100.’ So sweet of her. Grandma with my father Ray Jr., daughter Wendy and son Dennis. Last weekend at my home celebrating her birthday with my dad, my aunt and uncles and my brother’s family. 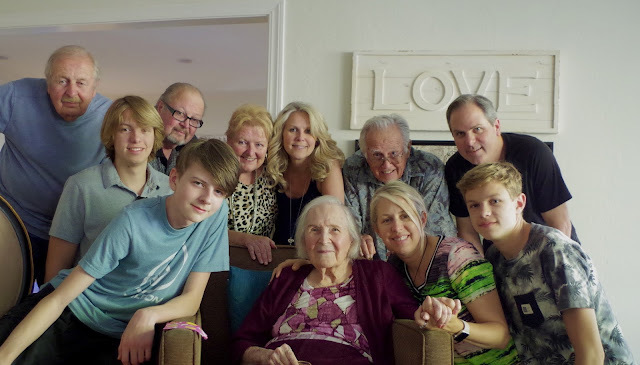 We were minus 3 grandchildren and 3 great-grandchildren and my husband Max who took the picture, for the complete family. Thanks for letting me share a little about my special grandmother! photos NorthernCalStyle. Please do not use without permission. What an absolutely lovely tribute! How lucky you are to have her in your life and know her so well. Bari, So nice of you. Thanks I know I am truly fortunate to still have her. Wow, so amazing, Kimi. I'm so happy that you still have her around. What a wonderful life she's had!! 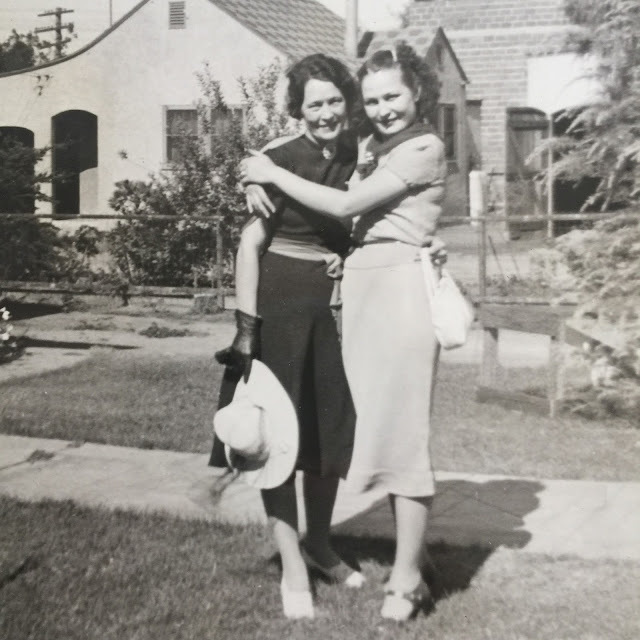 This was an absolutely lovely post, so nice to learn a bit about your grandma's life. A life well lived, and it looks like she is still going strong! I know right Andrea? Wow it makes my head spin to think of all the changes in the world. Thank you Andrea! And later my husband (and now son) worked for Disney. Your grandmother is lovely! HAPPY BIRTHDAY!!! Kim–this may be my favorite of all of your posts I have read. It truly shows how every life is special and touches so many others. Your appreciation of the gifts your grandmother has given you is very evident. I love this type of post from you–so personal and filled with love. Your grandmother is a lovely lady, stylish, elegant and above all, blessed. Mary Ann, You were a Southern Cal kid too! I bet it was great growing up there during those simpler times. Thanks so much!! This was wonderful to read Kim.Such a privilege to be able to share your Grandma's life story and how lucky you are to have such a lady in your life. That is something when you STOP and THINK. My grandmother partially raised me and my cousins, and anytime I was bored I'd find my way into her bedroom and look through her picture albums.. even though the depression was, well, depressing, folks stuck together and always smiled for pictures! Such an admirable part of our history.